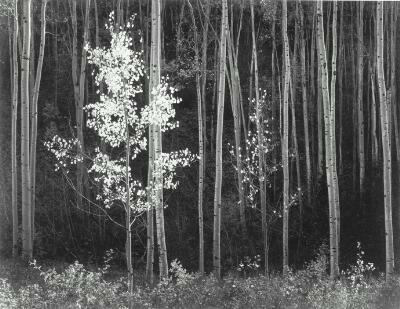 In this 1958 photograph, Ansel Adams wanted to emphasize the bright leaves of the young aspen tree against the darkness of the dense forest behind it. He studied the scene at length, determining not only how he would expose the photographic plate, but also how he would later develop and print it in the darkroom. His rule of thumb was to expose for the shadows, and develop for the highlights. This system required a great deal of testing, calibration and extensive record-keeping, but with it, as you can see, Adams achieved remarkable results. This photograph is a perfect example of a photographic method called the “zone system.” Adams developed this technique to overcome the limitations inherent in mechanical light meters. These devices are calibrated on an average tonal value—a middle gray. If used to determine the exposure time for a high contrast or low contrast scene, or one with predominantly dark or light tones, the resulting photograph will come out primarily gray. The human eye is far more sophisticated, and Adams wanted to capture not only what he saw, but his idea of what he saw. While some photographers have rejected Adams’ idealized view of the American landscape, his images have become icons of landscape photography for millions of people. The beauty, emotional impact and technical perfection of his prints set a standard by which landscape photography has been measured for more than half a century.